Kimberly began her Aikido training at Naropa Institute in 1978 and shortly after moved to Seattle to train with Mary Heiny Sensei. Determined athleticism, psychotherapy practices and energy awareness skills are key elements of her spirited teaching. 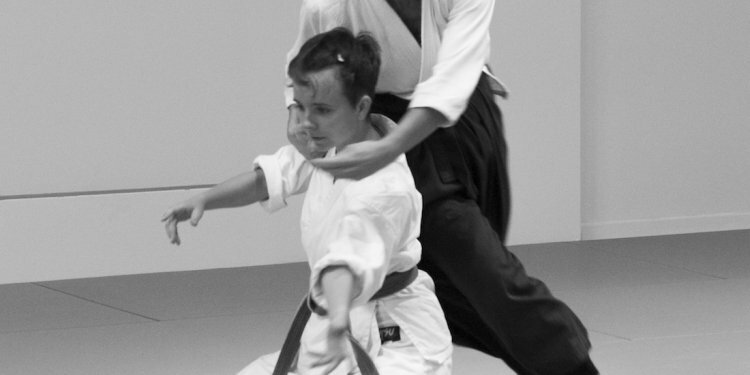 Kimberly has studied throughout the United States, Canada, Europe and Japan, most notably with Anno Shihan, Saotome and Ikeda Shihan, and Dobson and Read Senseis. She acted as chief instructor for The Apple Computer Aikido School in Cupertino, CA in 1989 and at Seattle School of Aikido from 1991 to 1995. In the fall of 1995, Kimberly founded Two Cranes Aikido, where she teaches the philosophy and practice of Aikido to people of all ages. As an adjunct faculty member at Antioch University for 10 years, she taught "Aikido as Martial Art and Spiritual Practice." Kimberly Sensei was promoted to the rank of 6th Dan by Mary Heiny Sensei in 2007. Richardson Sensei's teaching style supports the individual growth of each student. In addition to teaching Aikido, she practices tai ji and ballroom dancing, and includes elements of these art forms in her curriculum at the dojo. Kimberly is a consultant and trainer, offering workshops in conflict resolution, effective management styles and self-defense to corporations and to educational groups. In 2008, Kimberly organized the nonprofit foundation Two Cranes Institute. Her goal is to advance the common good by integrating O Sensei's practices of compassion and applied nonviolence into the larger Seattle community of children, teens and adults. Dave began his training at the age of 16 with Frank Doran Sensei. One of the most experienced members of the dojo, he has studied with Saotome Sensei, was a senior instructor at North Bay Aikido in Santa Cruz, CA, and Chief Instructor of Seattle School of Aikido. He works as Manager of Departmental Computing for the Biology Department at the University of Washington. Dan is a co-founder of Two Cranes Aikido who began his Aikido training in 1990 with Kimberly Richardson. Prior to training in Aikido, Dan practiced Tae Kwon Do for over 10 years. He studies Aikibojitsu with Tom Read Sensei, is 5th Dan and a Licensed Teacher of the art. He also practices Tai Ji Chen form and push hands. Dan has flown for Alaska Airlines since 1982. Joseph Perlmutter began his Aikido study in 1985 at Bond Street Dojo in New York under the tutelage of Paul Kang and Chris Jordan. Joey has instructed at Two Cranes since we opened our doors in 1995. After a long career in restaurants, Joey has embarked a new direction by working in a retirement community as an activities assistant. He teaches classes on balance and looks forward to bringing more movement oriented courses that will enhance the lives of the residents. Greg Mock, 4th Dan, began his study of Aikido in 1972 with Frank Doran Sensei at the University of California at Santa Cruz, where he also trained under Mary Heiny Sensei and Linda Holiday Sensei. Later, he became a founding member and instructor at North Bay Aikido in Santa Cruz. Greg is also a longtime student of Saotome Sensei. After moving to the Washington, DC area in the mid-1990s, he trained with Saotome Sensei and taught at Aikido Shobukan Dojo until moving to Seattle in 2010. As a consultant for the United Nations Development Programme, Greg analyzes and writes about successful models of sustainable development in the developing world. Sara teaches both adult and children's classes and acts as the Executive Director of Two Cranes Children's and Teen Program. Aikido's graceful and powerful forms along with her own playful nature drive her passion for working with children of all ages. Sara holds a masters degree in Music, ran a small garden design business for 10 yeaers, and now focuses her attention on furthering the growth of Two Cranes Aikido and Two Cranes Institute. Jessica Levin began her study of Aikido in 1988 in Albuquerque, New Mexico, at the age of 7. She achieved the rank of 10th kyu shortly thereafter—despite her insistence during the demonstration that uke grab her katatedori when sensei had asked for aidori—and a lifelong study had begun. Soccer and tennis pulled her away from training soon thereafter, but she rediscovered Aikido in college, and has been training with Kimberly Richardson Sensei ever since. She teaches both children and adults, and she has a particular love for ukemi both as a means of experiencing flight and as a study of relationship and integrity. As a staff attorney at the Korematsu Center for Law & Equality at Seattle University School of Law, she works to address issues of structural inequality and reduce explicit and implicit bias in the legal system. Taryn began training in 1996, when she was obtaining her degree in Earth Sciences from UC Santa Cruz. After graduating and moving to Seattle, she joined Two Cranes Aikido and continued her quest to train and teach teens and adults in a joyful manner. As a geologist, she takes pride in being the earthy one in the dojo and strives to add more fluidity to her practice. Taryn is also the Director of the Teen Program. Jen began her formal training in Aikido with Kimberly Richardson in 1998, earning a first degree black belt in 2005. Due to her father's Aikido practice, her philosophical education in Aikido started at a very young age. As a psychotherapist, Jen blends Aikido and existential phenomenological psychology in working with children and adults. In addition to her private practice, she manages the office at Two Cranes and acts as Director of our Mini-Cranes Program that provides instruction for four and five-year-olds.